SNOWatHOME® does it again. Introducing “SNOPRO” - the most cost effective snowmaker we’ve ever offered. Four years in development, the all new exclusive design delivers on every level without sacrificing quality. Like all SAH snowmakers, the SNOPRO head is constructed from solid aluminum, precision machined, fully polished then clear anodized. With nozzles specifically designed for the SNOPRO it is now possible to use a lower volume air compressor and pressure washer. A small compact design makes the SNOPRO extremely portable and easy to store. No assembly required! Insert legs into the stand and you are ready to make snow in seconds! The head is fabricated from solid anodized aluminum yielding a commercial quality snowmaker available for the home or small business owner. Through precision machining and SNOWatHOME's exacting standards perfect nozzle alignment and quality construction are achieved. Inner air and water chambers are pressure rated for 5000psi! Solid aluminum head acts as a heat sink to warm the air chamber and cool the water temperature resulting in an increased snow volume. The New SNOPRO™ design helps prevent air nozzle freezing issues that can occur with designs utilizing seperate internal components. Integated mounting for detachable LED light acessory. Stationary mount for plume illumination that detaches to use for checking on your components. SNOPRO™ has nozzles that have been specifically designed to work with this unit's head design and decreased air and water requirements. These nozzles can only be found on the SNOPRO! It has taken years of research utilizing everything from flow meters to microbolometers to be able to design the ULTIMATE home snow making nozzle. Based on our findings we have precision nozzles that are now manufactured specifically for SAH™. The air hose comes with a removable, ¼” NPT, quick connect air adapter making it compatible with SAH’s™ 4.4cfm air compressor and most other compressors on the market. The water hose comes with a 22mm pressure washer adapter making it compatible with SAH’s™ 1.3gpm and 1.7gpm pressure washers and most small pressure washers (1.3-1.7gpm) designed for home use. 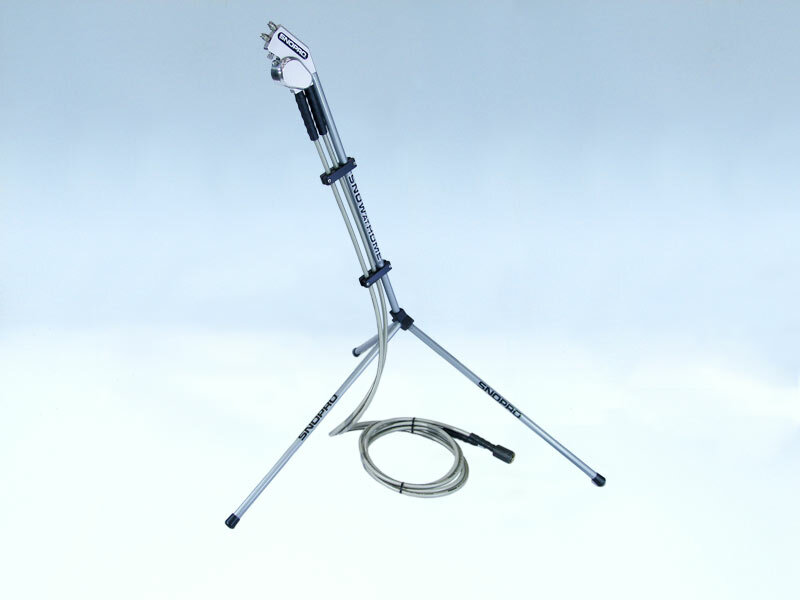 The stand integrates seemlesly into the snowmaker creating a stable base for your SNOPRO's operation. Stand completely disassembles for easy transport and compact storage. Air Compressor - electric or gas: rated for continuous use (not oil free) with a minimum output of 4.4CFM at 90PSI. (Minimum maintained operation pressure of 50psi) SNOWatHOME™ recommends the Ingersoll Rand 4.4cfm@90psi Air Compressor. A larger air compressor will work as well. Pressure Washer - any electric or gas rated for 1.7GPM or less 1200psi to 4000psi. SNOWatHOME™ recommends the SAH-13EP 1.3GPM Pressure Washer or the SAH-17EP 1.7GPM Pressure Washer.